Your Hanns-G monitor is not working. Your power light flashes, you hear a popping sound and yet the monitor does not come on right? This sounds familiar doesn’t it? Some time ago your monitor made some popping noise when you first turned it on but it would still turn on. Over time it took longer and longer to turn on and continued to make the popping noise. Now it will not turn on at all. Guess what…your monitor likely has a blown capacitor or eleven. The good news is this is an easy fix if you are confident with a soldering iron and disassembling sensitive electronics. At this point I am going to assume you are technically savvy if you are taking on disassembling a monitor’s power supply so I will only give you the details. 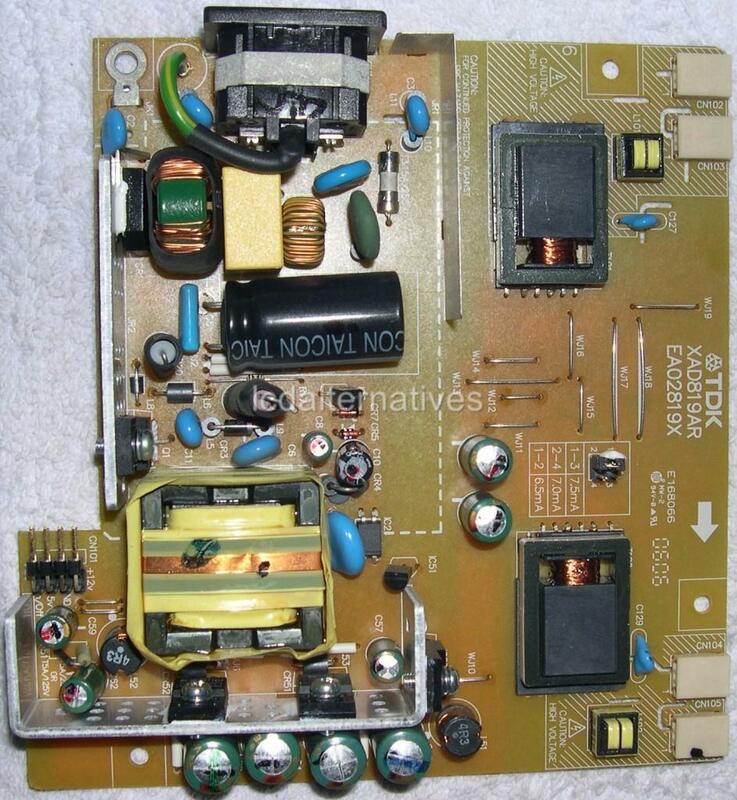 Identify and remove the power supply board (see picture below). Image of the power supply board from LCDALternatives Most of the capacitors in this image are green cylinders. CCl-LA also has a good photo of size of the capacitors. Identify the bad capacitors. They will have a “domed” top indicating that they have burst. Desolder bad capacitors and solder in the new capacitors (full list below the pictures). Note that you can you a capacity with a higher voltage but the UF must be the same. Reassemble. If you forgot the plug locations for the power supply (like I did), see the picture below. This is a full listing of all of the capacitors on the board except for the HUGE on which I am told rarely goes out. I only replaced six of the capacitors on my monitor based on the damage I observed. I recommend shopping Tayda Electronics. They are the cheapest place I have found any electronics such as capacitors, resistors, ICs, proto boards, and tons of other good stuff. They do not have the selection of an Adafruit or Digikey, but for what they do have it does not get any cheaper. I do not work for Tayday nor do I get any kind of referral compensation from them. They are just a vendor I been very pleased to work with. Thanks Tayda!